Fire Fighting Equipment in Northampton and The MidlandsFire fighting equipment is an essential ingredient of any fire precautions plan. 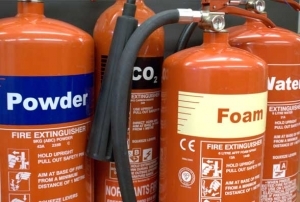 Correctly sited and properly maintained, fire extinguishers can stop a small fire growing quickly out of control. The quality of fire fighting equipment is crucial. Ease of identification, reliability and ease of operation are all vital components of a quality fire extinguisher. We firmly believe that our range of extinguishers meet these criteria. Northants Fire Ltd is a BSI and BAFE registered company and our engineers are all fully trained and registered under the BAFE ST104 scheme. Many customers will already have fire fighting equipment in place. We can service any make and model of fire fighting equipment that is compliant with current legislation. Northants Fire Ltd supply only Kitemarked extinguishers manufactured to EN3 and carry out maintenance in accordance with BS5306 part 3 and part 8.